Esports didn’t always have a major impact on gamers’ lives as it does today, but there’s always been an admiration for it. As Esports evolved, so too did the environment around it. Esports betting quickly started becoming a thing and it too, grew alongside Esports as a whole. One great example of this growth is TonyBet; an Esports bookie dedicated to creating the best experience possible for betting lovers. Esports betting at TonyBet is sweet; you have everything you need in one place. 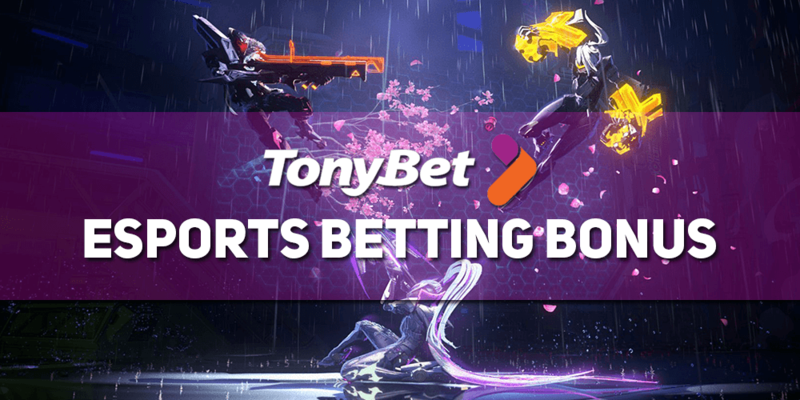 TonyBet is a respected and trusted bookmaker for several reasons - an okay Esports game collection, and plenty of interesting bets. The betting process is simple as well; more on this in a bit. Esports MOBA: Here, you’ll find League of Legends as well as Dota 2. These are the two most popular MOBA games at the moment and their Esports scene is incredible. It only makes sense that a high-quality bookmaker would include them as betting options. Esports FPS: Again, two games in a category. The current most popular multiplayer/competitive FPS is CS:GO. Every larger tournament is filled with spectators and the teams are sharp most of the time. This ensures great action. The second one is Overwatch which is becoming increasingly popular as time goes by. Currently, there are more than 65 available betting options for the FPS category and 15 for the MOBA’s. This is due to the pre-season in League of Legends and Dota 2 so there’s less to choose from. You can be sure that this is what you can expect from TonyBet on a constant basis. Interested in CS:GO betting? No problem; just head over to TonyBet! If you’re interested in placing Esports bets, you’ll mainly have two major options to choose from. In one case, you can select which team will win between the two (the odds are shown to you for each team). This is generally the simplest betting option to place because there’s a rough 50/50 chance for you to win. Then there’s the outright winner. Most tournaments that feature a knockout stage will get presented to you with an outright winner option. Sometimes, special bets appear but this all depends on the tournament and the game. When it comes to betting odds at TonyBet; they’re very good. The bookies take great care in creating the odds so everything is fair. You won’t be ripped off and you might even win a bit more than somewhere else. The truth is, TonyBet is one of the best bookies when it comes to the available Esports betting odds. If you want a place that you’ll visit regularly so you can place your favorite Esports bets - TonyBet is the place for you! If you visit the website now, you’ll find that there’s a 100% up to €200 bonus for new Esports players. All you have to do is register at TonyBet, make any deposit with the bonus code TONY200 and you’ll get your bonus! No matter what type of credit card or online wallet you have, TonyBet probably supports it. This is great news for everyone that loves betting because you won’t have to turn around and look elsewhere - a vast number of payment methods are accepted! The only method that you can’t use for withdrawal is PayPal. So keep that in mind if you plan on betting at TonyBet. The customer support team at TonyBet is astounding. They’re dedicated people who take their jobs seriously. They’re efficient and will try everything to help you solve a potential issue. Whatever the case may be, if you can’t solve it yourself, be sure to contact them. You can contact them through E-mail or by phone. The customer support team is also available through live chat which is handy if you’re in a hurry!